As most major bands go into festival mode at the moment, London plays host to the best of the alternative bands from across the UK and worldwide. German classic rock your sort of thing? Then on Monday night get along to the Hammersmith Apollo, where Scorpions are playing their re-union tour (who isn’t doing a re-union tour these days?) Support comes from The Michael Schenker Group, and tickets are £35 each, still available from the usual outlets. Alternatively, for something a bit quieter then American folky singer-songwriter Laura Veirs plays Bush Hall, though tickets are now sold out. Meanwhile over at the Arts theatre Dutch-Israeli singer songwriter Keren Ann brings her French indie pop / singer-songwriter talents to the capital for the first time in a long time. Tickets are £19.50 each and still available from ticket outlets, though going quickly. Tuesday night sees The Luminaire play host to Monkey Swallows The Universe, who claim to write songs about “bittersweet love, jealousy, apathy, imaginary friends, and pirates”. In fairness they sound surprisingly good, and tickets are still available from We Got Tickets at £5 each. Support comes from Viaros and James Severy. Elliot Minor bring their pop-punk to the Barfly – tickets are £7.50 each. 50 Cent prodigy The Game plays the Forum, with tickets £25 each. The Islington Academy is hosting Japanese rock stars Dir en Grey on Wednesday night for the first of two nights in the capital. Tickets are sold out, so expect lots of screaming Japanese fans in the Islington area on Wednesday night. Mount Eerie play Bush Hall to bring their lo-fi fuzz-folk to their biggest show to date. Tickets are £8 each. In a week of alternative acts hitting the capital, Of Montreal plays Scala on Thursday night with support from Pull Tiger Tail. Tickets are £12.50 each for the indie-pop supremos. Friday sees Dresden Dolls singer and pianist Amanda Palmer play Bush Hall for a solo show, though tickets are sold out. Old school star Isaac Hayes plays Shepherds Bush Empire, with tickets at £25 still available. 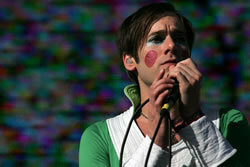 Photo of Of Montreal's Kevin Barnes at Coachella taken from Media Eater's flickr stream.